I understand that the name may put you off. Eels just don't sound appetizing. But they are and they're more luxurious than you could imagine. 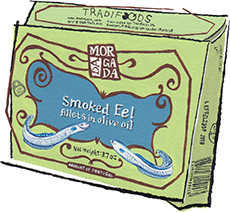 This tin has four flakingly tender eel fillets, lightly smoked so they remind me of bacon that came from the sea. Milder than mackerel or sardines, they have a texture that reminds me of salmon crossed with sea bass. Amazing stuff, with the kind of out-of-fashion packaging that belies the high quality of fish within. Eat them on their own, forked out of the tin. Or top a green salad with a couple fillets, capers, Marash red pepper and lemon zest. An unparalleled late night snack.